Coloring Eggs: How do the Chickens do it? While we scramble around finding the newest and, likely, easy clean-up ways of coloring our eggs for the upcoming holidays, I stopped to wonder, If we all had Easter Eggers, we could get through Easter vinegar-free and with un-stained hands. How DO chickens color THEIR eggs? 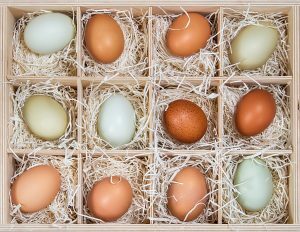 We know that there is a plethora of colors, shapes, and varieties of eggs. Eggs come in several sizes, with hundreds of varieties of speckles, and even more hues of beautiful colors. We also know, from science, that all eggs start out with white shells. How, then, do the eggs we gather in our coop turn out green, brown, blue, copper, pink and any variety of color in-between? Well, according to this study done by the University of Michigan, chickens have a couple of different chemicals in their genetics that are deposited onto the eggs as they travel along their 26-hour journey to being breakfast. Blue egg layers, such as Ameraucana, deposit a chemical called oocyanin early in the process, while others, such as brown egg layer, deposit a different pigment, called protoporphyrin, onto their eggs later in the process. These pigments are the equivalent to our vinegar and food coloring solutions in that they color the eggs. The timing, however, has a different effect. If you’ve ever cracked a blue egg, you would be able to see that the inside of the shell is just as blue as the outside. This is not true of other colored eggs. Upon cracking brown eggs, you would see that the inside of the shell is not the same as the outer shell, but white instead. This is where the timing of the pigmentation comes in. When a blue egg layer deposits oocyanin early in the process, it is able to permeate the shell, therefore dying the egg inside and out. The protoporphyrin, however, does not permeate the depth of the entire shell because it’s applied when the shell is less absorbent, therefore leaving the inner part of the shell to remain its original white in color. So, this year, as you and the kids are spending quality time trying out the new shaving cream egg-dying method, this might be a nice fact to share with them and you can marvel together at how Mother Nature has it all figured out. Want more fun facts about chickens?